New University of Texas Rio Grande Valley women's basketball coach Lane Lord talks about his expectations for the team during his introduction as coach Wednesday, May 30, 2018, in Edinburg. EDINBURG — In the weeks after the UTRGV women’s basketball head coaching position came open on April 21, athletics director Chris King received 40 applications. Of that group, at least 26 had Division I coaching experience in some capacity. But rather than target an assistant from a topflight program, King set his sights on Lane Lord, the head coach at Division II Pittsburg State. Lord’s only other coaching experience was at the high school and junior college levels, but he compiled a 231-102 (.694) record during his 11-year run at Pitt State. 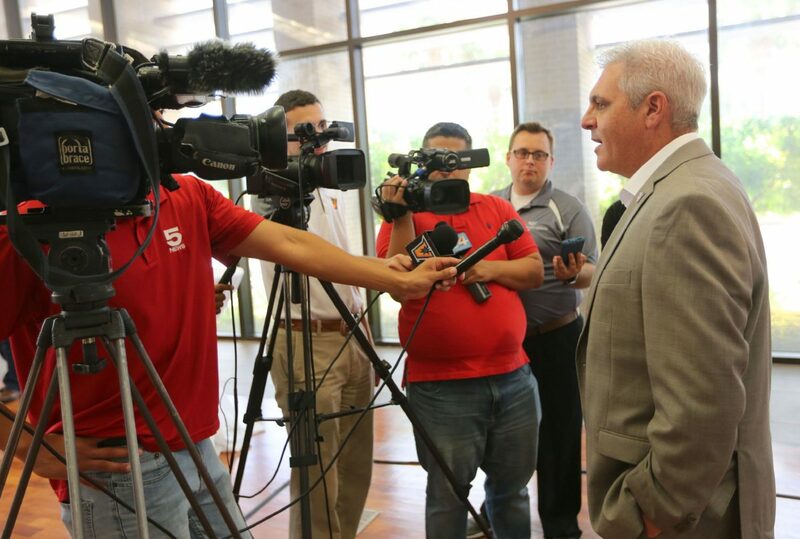 Lord was tabbed for the UTRGV job on May 21, and he was introduced to the Rio Grande Valley media on Wednesday at the UTRGV Visitors Center. UTRGV women's basketball coach Lane Lord, right, meets university athletic staff and supporters during his introduction as coach Wednesday, May 30, 2018, in Edinburg. In the past seven years, Lord led Pitt State to five NCAA Division II National Tournaments and the program’s first two Elite Eight appearances. 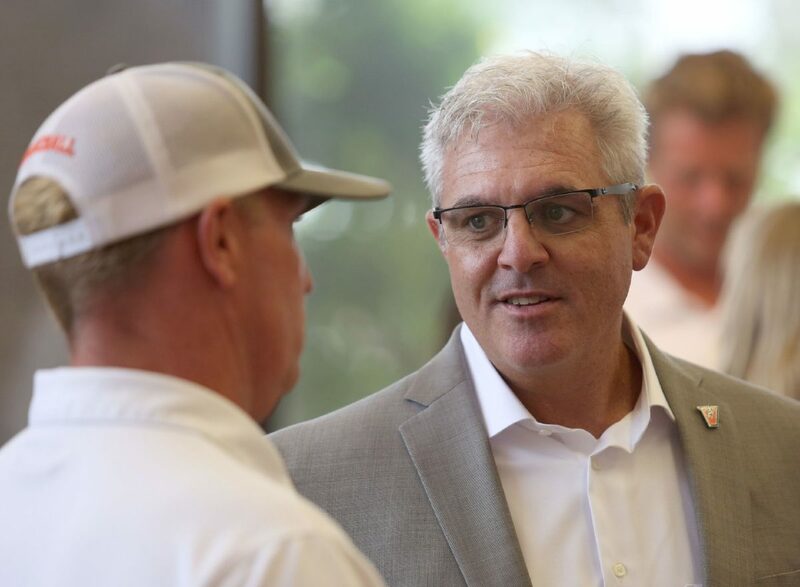 During the hiring process, Lord’s resume reminded King of UTRGV volleyball coach Todd Lowery, who coached at the NAIA level before taking over the UTRGV program and leading the team to a WAC Championship in only his second season. Among the applicants for UTRGV’s women’s basketball vacancy was Fred Chmiel, an assistant coach with South Carolina the past three seasons who helped guide the team to a national championship in 2017. Lord said moving into a Division I coaching position marked the realization of a dream he’s had for many years. He said the biggest adjustment is going to be having more staff, with a group of four assistants ready to begin next week. After consistently fielding a winning team in what he called arguably the best Division II conference in the country, Lord said he doesn’t anticipate too much change from a basketball perspective. Another early priority for Lord was “re-recruiting” the potential returners from UTRGV’s 2017-18 roster, and he said the entire group is slated to be back for 2018-19. He also said he’s been working on the recruiting trail from the minute he got the job, looking to secure future commits with seven seniors expected to play for the 2018-19 team. Lord replaces Larry Tidwell, who set the program’s all-time record for wins (85) and winning percentage (.531) during his five-year tenure before leaving to become an assistant coach at Texas Tech. The UTRGV program had never posted a winning record in a season at the Division I level before Tidwell notched three consecutive winning campaigns from 2014-17. King said Lord begins his tenure at UTRGV with a base yearly salary of $150,000, a figure reached by looking at the salaries of other women’s basketball coaches around the WAC. The number is also higher than Tidwell’s starting salary, King said. Tidwell finished his UTRGV career making $175,000 per year after a pair of performance-based raises. Lord will be tested early against a difficult nonconference schedule that includes a home game against the University of Texas and road games against Baylor and Texas A&M. The UTRGV men’s program is hosting Oklahoma this fall, giving the department two marquee home games for 2018-19.